Please be advised that on Saturday, September 16, 2017 and Sunday, September 17, 2017 between the hours of 10:00am - 3:00pm, Brooklyn Tech High School will be hosting the Citywide High School Fair for all public schools throughout NYC. Students can qualify for LIMITED unscreened schools by signing in at the fair! 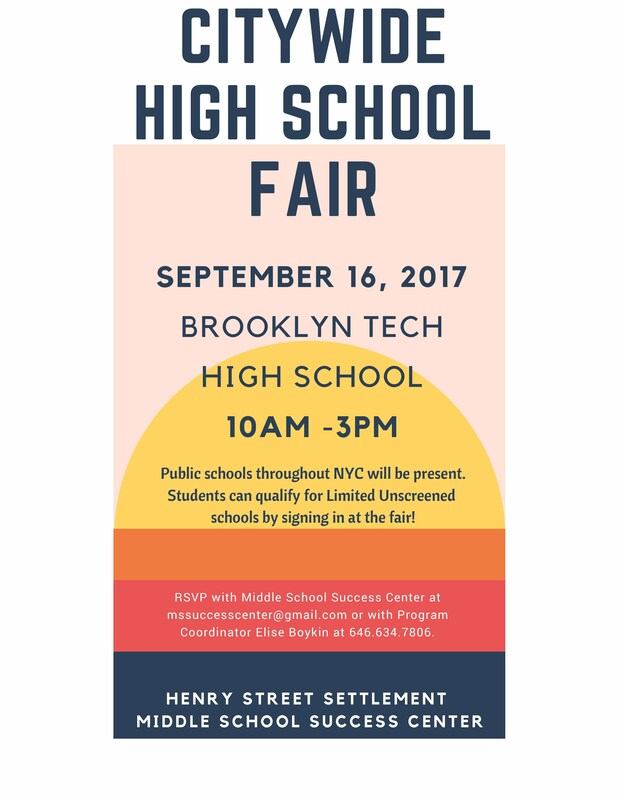 RSVP for Saturday, September 16th with the Henry Street Settlement Middle School Success Center at mssuccesscenter@gmail.com or contact the HSMSSC Program Director, Elise Boykin at 646-634-7806 with additional questions and/or concerns regarding this event.